It’s that time of year again—when we can shed our bulky sweaters and heavy coats for some summertime fun in the sun. Let’s make some bright and bold summer plans. Here are a few tips and trends to steer you in the right direction when planning your next summer soiree. Everyone seeks a great outdoor space for a summer event. Take advantage of unique spaces that have indoor and outdoor options, along with great views. That way you’re not scrambling for an alternative if there’s bad weather. 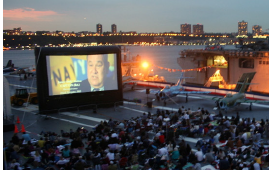 The flight deck of Intrepid, our award-winning rooftop space, fits the bill. 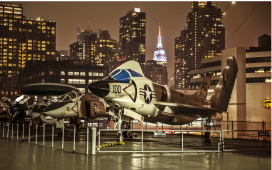 Whether you want an epic movie night or a sleek office happy hour while enjoying views of the skyline with your coworkers, you can have it here on Intrepid! Summer is the time to lighten up. Embrace quirky, embellished themes with bright colors like yellows, oranges or purples. The neutral gray of our stellar aircraft carrier provides a great contrast to all summer tones. Below are a few creative presentations of mod-inspired furniture that would brighten up your space. Pictures by Taylor Creative Inc. Choose your menu items carefully. 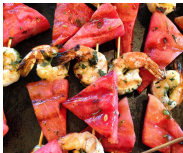 A variety of refreshing and light options allows your guests to enjoy a wide sampling of small bites without feeling bulky on a hot summer day. Some go-to classics we recommend are grilled watermelon skewers and—our all-time favorite—boozy Popsicles! You get a colorful drink and fruit all at once, and it’ll cool you off while you enjoy it. What could be better? For more ideas, contact the Special Events team. We are here to help! Read more at intrepidmuseum.org or call us at 646-381-5301.